"I got this recipe from my mother-in-law many years ago. It's a family favorite and a great treat for potlucks. It's very easy to make but looks like you've spent hours on it." Preheat oven to 350 degrees F (175 degrees C). Line 24 muffin cups with paper liners. Place a vanilla wafer into the bottom of each muffin cup. Beat cream cheese, sugar, eggs, lemon juice, and vanilla extract in a bowl until fluffy. Spoon mixture into the muffin cups, filling them 2/3 full. Bake in the preheated oven until cheesecake filling is set, 15 to 20 minutes. Let cool completely, about 1 1/2 hours. Spoon 2 or 3 cherries from pie filling over each cheesecake. 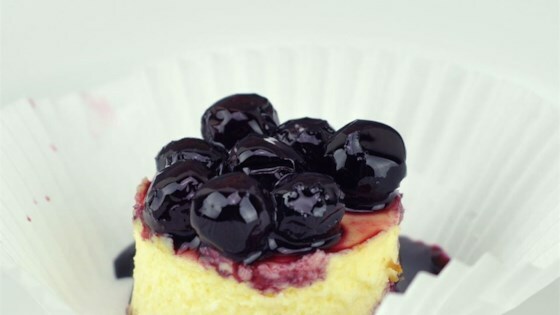 These cheesecakes are both impressive and super easy. I've made this with vegan wafers and dairy-free cream cheese for a friend with a milk allergy. She loved it. This was a hit at my party! I did alter it though. Instead of the cherry pie filling, I whipped whipping cream until it peaked. Added it on top with fresh berries. It was a hit! I used the mini vanilla wafers in mini-muffin papers. I make this recipe a few times a year for different occasions and its always a hit. Quick and easy to make and delicious! Followed recipe as written.... MADE 60 MINI’S....... Super simple to make. I used the mini muffin tins and mini vanilla wafers.